Look what's for lunch - it's the cat and the mouse! Use the cat shaped cookie cutter to cut two identical pieces of bread. Put mayo on the inside of the two cookie cut pieces of bread. Then layer the turkey, cheese, and lettuce between the pieces. Be sure you keep the filling inside the borders. 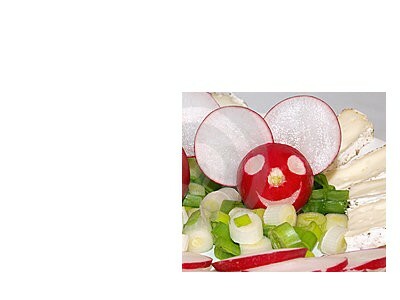 Now make a radish mouse garnish or an egg and radish mouse to accompany your sandwich. As a garnish, cut radish bottom lengthwise. On one end cut a notch on each side of radish head. Using the cut bottom, cut two small pieces for ears which will insert into each notch. You can use tiny raisins or olive pieces for eyes. Be sure you use a radish with a tail. Or you can accompany your cat sandwich using a hard boiled egg for the mouse's body, chive tails, radish ears, and olive eyes. Return to Healthy Lunch Recipe Contest.